I’m setting up yet another challenge for myself this year. I have a super busy year ahead of me, and I have a lot that needs to get done. I also have a lot I just want to get done, so as to not have so much unfinished stuff hanging over my head and to get more organized. But I’m also a flitter by nature, which is partly why I’m in the mess I’m in (short attention span), and I have to play games with myself to keep on task. All these challenges are what I need to keep me moving in the right direction. By making them public on my blog, it makes me a bit more accountable than I would be if I kept them to myself, and it gives you all a chance to join in with me if you should want to. So I’m starting . . .
On the first Monday of each month, I’ll randomly draw a number between 1 and 12, and whatever number that is will be the project I will concentrate on during that month. I’ll work on that project as much as I can until the first Monday of the next month, at which point, it will either be finished, or at least moved along further towards finished, and I will then draw another number, for another project to work on for the next month. Maybe the momentum will keep me going, and I’ll be able to finish all 12 of the projects this year — time will tell! So . . . my first number drawn, for January, is: 2. Number 2 on my list is my Bluework Quilt. All that needs done is to get it quilted. I believe I have a backing already fixed up for it, and I’m pretty sure the binding is around here somewhere, too. I made this quilt from a pattern in a magazine. I made it so many years ago, I don’t even remember which magazine, or I’d tell you. The magazine’s version was red, and I don’t think I even have the magazine any more. But my goal now is to get this quilt finished before the first Monday in February, and I’ll have one project I’ve been procrastinating about off my list for good! Do you have 12 projects you’ve been procrastinating on that you’d like to get off your list this year? Why don’t you pick one and join me in working on it this month? I’ll be picking my next project on February 2nd, so I’ll let you know how I did with this one, and what my next project will be. If you’d like to join me, leave me a comment and let me know what project you’ll be working on! Hymmmmm it seems to me that your goal for the year is to keep me busy!!!! Do I have 12 projects? ROFL. I’m game. I already was thinking about doing this so I already have 12 projects written down on little slips of paper in a small crock bowl waiting. I will get back to you on which one is chosen to be the lucky project. Kind of relieved..I was afraid these were going to be house projects!!!! I love your project for this month. OK – I am in. I have my list of 12. I picked #10. This is one of the first quilt kits I purchased. When I was little my mother read me and my brother & sister Thornton Burgess books. This panel quilt reminded me of the animals in his books. 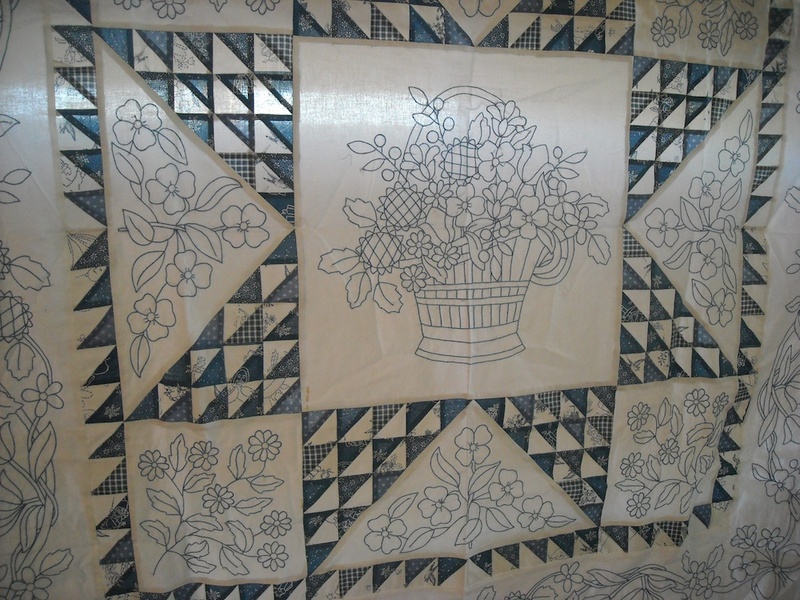 I pieced it several years ago and it has laid in the bottom of my quilting basket since. I do have the backing and the binding also just needs quilted. Since it is a baby quilt hopefully I will complete – I do have to finish the quilt that is on my machine before I can start. I love all of the new year goals – hopefully we can finish some UFOs and get organized in 2015!!! Boy, are we thinking alike! 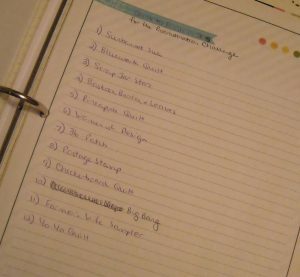 I had been thinking about creating a list and randomly selecting from it for “Major” projects around the house–painting my daughter’s bedroom, organizing & scanning our pictures, cleaning up the garage, etc. I hadn’t thought of limiting it to only 12 projects to work on throughout the year(one a month), but I think that is brilliant! I’m off to finish my 2 lists: 12 sewing projects/12 major projects. Even if I don’t get all 12 done, at least I’m heading in the right direction! Thanks Shelly and Barb for the suggestion for both sewing and house/garden projects. I don’t have a finalized list yet but I have lots to choose from in both areas. As I’ve started painting the walls in the kitchen today I guess finishing the kitchen decorating will be January’s task – finish wall painting, wall tiling, adding skirting board, and gloss painting everything – lots to do! Now to write those lists! 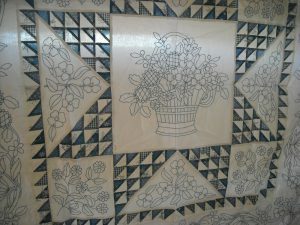 This year I’ve decided to focus on the quilts I started prior to 2007. So naturally I started pressing my floral fabric for the backing of a quilt I did in 2013 — which is not even a quilt that has a destination yet. There are two other newer quilts which I want to finish by mid-February that need backing made. But for this challenge, perhaps I should pull out the oldest — the Christmas BOM which just needs two blocks and a border before it can land in the to-be-quilted stack. Sounds great! I have my “guilt” list of quilts to finish this year. The first is a memorial quilt for a friend’s son. What a good idea, am in will go home from work tonight and work on my list and then draw a #. They are saying we will get up to 7 inches of snow today and tonight so maybe tomorrow will be a sew day instead of a work day, let you know what I end up working on. Have a great day. You, Barb and I must have our little antennae going. I plan in dong somewhat the same. I have lots to finish!!! I have a hour glass quilt to put 2 borders on and quilt and that is my January project! I have 162 of them. LOL I have list of 6 that I randomly pulled from the UFO cabinet. I have the same plan, but to give myself 2 months to finish each one. That’s because I have so many others I know I will want to work on during the year. last year it worked for me and I got all 6 of these “not what I’d normally pick” quilts done. Made my list and getting into a truck of “unfinished projects” was like Christmas. Things I had completely forgot about. I think I have enough UFOs for every day of the year – embarrassing. Anyway, I drew No. 6, which is a Noah’s Ark ??? I don’t even remember what I was going to make with it, but it is going to end up being a COMPLETED wall hanging. Do you want before and after photos? I wanted to do this after sifting through the UFO bins and at the same time I am working on finding stuff that I can throw/give away…………trimming down the piles of stuff in this house. Unfortunately the first quilting project I picked has already stumped me. I think some projects just aren’t worth working on and yet and yet and yet. Is this the Squirrel Effect in its incubating stage? Whatever, I am better than this project. I may throw it away. I don’t know about the 12 project list of old stuff. I have a list of current stuff. Only once in a while does something move off the old stuff list. Probably more than twelve. =) How about a button for it and I’ll post it on QultBOM. Are you going to make a new 350 blocks button? Is that going to go again? Now that I have my fabric stash organized, I found a bunch of projects that were started and then buried. I am going to make my list of 12 and get started! I made my list last week and started with the oldest one first. The thirty blocks are done, but may get put aside for a week or so. There is another partial one in another pile which needs my attention. The squirrel is alive and well in Arrow Rock. I am in. I am working on #1 Christmas quilt. Only 12?? I have at least 50 quilt tops that I need to get quilted…so what do I do, I leave for 2 months and I can only piece more quilt tops!! 2 tops are finished already and I have material with me for at least 2 more!! I’ll join you when I get back home and can dig into the quilting! I agree with the first comment – we’ll be busy this year. Like you I have a very short attention span and have numberous projects in various stages of completion. I’ve made it my goal to concentrate on my UFOs this year. So here’s to us, a successfully finished year. I’m actually excited about getting out these old UFO’s that I haven’t wanted to touch in ages. Thanks for the motivation! This is a great idea! And your blue work quilt is amazing! Will you give an update at the end of the month as well as show us the next project you’ll be starting? Good luck with everything! Found the perfect sign for you in Connecting Threads magazine. It says “Finished is better than perfect”. I’ve been trying to get back to my UFOs for so long and never quite find the time, so maybe having company in this endeavor will be the motivation I need to keep going. I haven’t completed my list yet, but my first (and most important) finish will be a quilt for a dear friend who is a breast cancer survivor. Thanks for the challenge! I will start with Feb. I have put down 6 items down for the guild challange and want to get more than that done so i will start next month and put down 11 things i want to get done each month for the YEAR 2015.